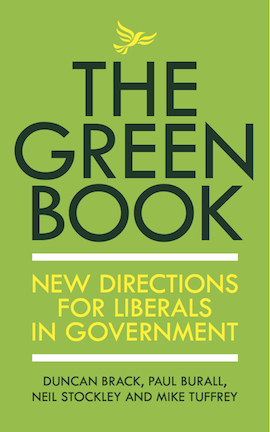 The Green Book: New Directions for Liberals in Government brings together 27 leading Liberal Democrats and sympathetic experts to propose radical and innovative new directions for the Liberal Democrats. The Green Book argues that a low carbon economy and environmental investments are the best way to escape from sluggish growth, to create new jobs and to share prosperity fairly. The Green Book calls upon Liberal Democrats to treat the environmental crisis as a core challenge of economic policy, rather than as a discrete problem. 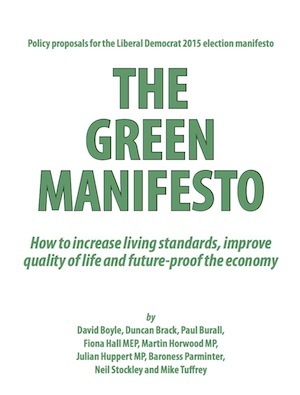 Edited by Duncan Brack, Paul Burall, Neil Stockley and Mike Tuffrey, the book originated in discussions within the Liberal Sustainability Network. It was made possible by a generous grant to cover publication costs from the Joseph Rowntree Reform Trust Ltd – which funds political campaigns in the UK to promote democratic reform, civil liberties and social justice. The Green Book offers both a wake-up call and an agenda for action: The threats from climate change and finite limits on natural resources are more serious and more urgent than most people acknowledge, it says, but green policies can put our country en route to a modern sustainable economy and just society - now in government, for the coming general election, and beyond. Launch of policy proposals for the Liberal Democrat 2015 election manifesto - Liberal Sustainability Network/Green Book, with the Sustainability Hub. Join the debate on Facebook.